I hadn't heard much about this series before I read the first book myself, but the cover captured my interest right away. It's so chillingly intense. Mafi writes well and her style is beautiful. Some lines are unnecessarily flowery, and ones like "I melt, hot butter dripping down his body" are ridiculous; I hate how the author skips right past the simile and makes her character become the "butter". It's too much. The world is interesting. I think it's a bit limited - I would have liked to have seen more of it - but the imagery we're given is stunning, and that makes the bit of world and civilisation quite fascinating. The plot isn't original (especially towards the end where the climax is a sequence of scenes I've seen so many times before). Things are also very easy, very smooth running for the heroine, and yet......it's never boring. The action is great, and the story is exciting. It's a light, fun read. That's what it is. Sometimes I think the loneliness inside of me is going to explode through my skin and sometimes I'm not sure if crying or screaming or laughing through the hysteria will solve anything at all. Sometimes I'm so desperate to touch to be touched to feel that I'm almost certain I'm going to fall off a cliff in an alternate universe where no one will ever be able to find me. I love the heroine. Juliette has a firm set of morals, and despite her inner demons, she's passionate and fiercely devoted to what she believes in. She's easy to root for - I love her beautiful personality. The characters are vivid, and I like that. At the same time, however, Adam is a boring love interest with very little personality, Warner is an interesting villain but PLEASE do not let there be a love triangle in the second book and then gloss over his problematic behaviour towards Juliette, and the secondary characters are flat, fade-into-the-background figures. Juliette is the best written character by far, and without a doubt carries the book. I don't ship the romance. Adam and Juliette's relationship isn't well developed, and despite them having apparently known each other as kids, that bit of their past is never tapped into deeply enough. As a result, their relationship in the present feels very insta-lovey. They need more development. 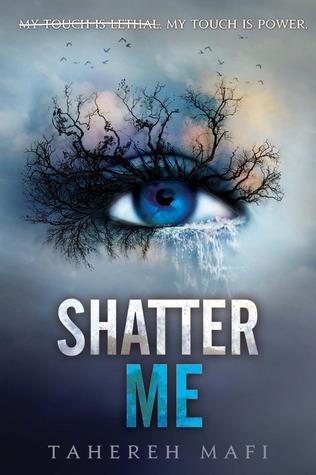 Shatter Me is a fun, intense dystopia with a compelling heroine. But the weak romance and convenient plot line are unfortunate.